Quick Help to Increase Pedestrian Safety at Vehicle Exits - iSIGNS Inc.
iSIGNS Inc. in Fairview, PA iSIGNS Inc. in Fairview, PA offers several sizes and models of LED illuminated CAUTION VEHICLE EXITING and CAUTION CAR COMING signs to help warn pedestrians of approaching vehicles and impending danger. Parking Garages, Automobile Dealerships, Vehicle Service Centers and Car Washes often have vehicle exit paths that cross pedestrian walkways. In many cases, building structures become obstacles preventing drivers from seeing pedestrians until they are right in front of them. Also the introduction in recent years of nearly silent hybrid and electric vehicles has brought increased risk to pedestrians in vehicle exit areas. Strategically placed exit warning signs and vehicle alert signs or devices can help increase safety for both motorists and pedestrians. When used with vehicle sensors or open door sensors, these signs can be activated to display a warning message to keep walkways and exit paths clear and safe. Accessories like flashers, beacon strobes and audio alarms are also available to provide an added element of warning. Need a help for a vehicle exit that poses a danger to pedestrians? 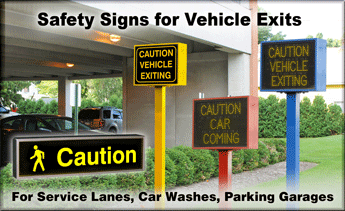 Help to avoid accidents…put these signs to work now at dealerships, car washes and parking garages! For questions Email or call us toll free at 866-437-3040.